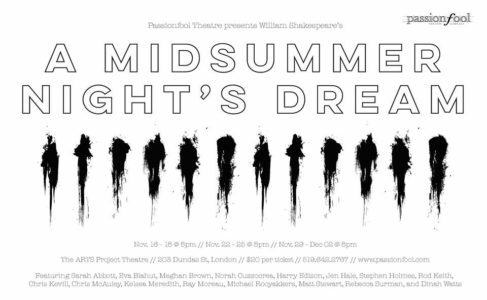 Dream is among the most-produced plays in history; this site currently has a record of at least ten productions since 2007 in London alone, including two in the same month (April 2012)—and that doesn’t include adaptations, modernizations, and spinoffs under different titles. Three years ago the Stratford Festival produced two versions in the same season, a traditional presentation at the Festival Theatre (one of the funniest I’ve seen) and an outré “chamber” adaptation directed by Peter Sellars (one of the strangest). In one twelve-month period thirteen years ago I saw five (maybe six?) Dream s, including one performed on roller skates to disco music at the Winnipeg Fringe Festival. To make a long story short, it’s been done. Yet Passionfool has still been able to make Dream its own, deconstructing the play and taking conventions of theatre and meta-theatre and turning them both on their heads. A one-person “chorus” introduces the production and explains his role in it, but as the presentation goes on, the other actors in the ensemble become more of a chorus for him. Sections are performed similar to improv comedy games. Huge swaths of the play are left out or glossed over; others are repeated and reshaped. Actors are double-cast and gender-swapped; at times they’re called on, and called out, as themselves, and at others their roles appear to graduate from the play to real (stage) life. It’s testament to all involved that it makes any sort of sense. There’s a lot going on, and it’s educational and entertaining… to a point. To its credit, the production realizes this, and the cast’s developing (stage) grumbles allow it to twist back on itself for a satisfying conclusion, but that all happened well after I started trying to recall phrases like “much of a muchness”. Passionfool’s A Midsummer Night’s Dream is unique. It’s challenging, not least of all to the cast (who, it almost goes without saying, are excellent). It’s sure to provoke interesting discussion over post-show drinks. But while it’s a clever take on an often-seen classic, it may just be too clever for its own good.